I have been so MIA, I know. Sometimes I even feel MIA in my life lately - I sort of check out. This past week has been busy though. I am trying to find balance as always but it's hard. My family from up north came down and we had a fun day at Disneyland. It was so nice, I hadn't seen my niece and nephew in over a year! I could hang out in those long lines with them any day. Hopefully I can get up there for Christmas this year. I've also been on a cleaning/reorganizing-the-house-kick. I wish I had more of this energy more often! I have been scouring Etsy for vintage finds, and I will be possibly going to Goodwill soon. Honestly though, thrifting overwhelms me and I don't find that many things I like. I usually end up paying full price at Target or Cost Plus. Oh well. I also released custom made-to-order necklaces in my shop! These are the coolest bottles I came across at a gemstone/bead expo. I am going to be ordering a lot more in the near future from my vendor, so let me know if you have any special requests for themed bottles and I can see what I can find! I love the moons but there are also a lot of animals and other sacred symbols he carries. You can find my listing here. 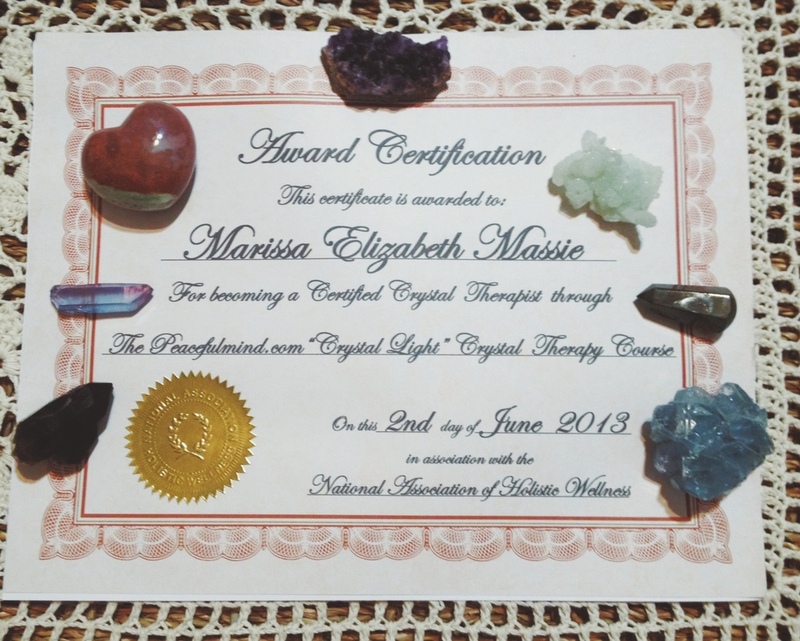 I received my certificate as a Crystal Therapist! I am recognized by the National Association of Holistic Wellness as a crystal healer! It feels so surreal. That same day I received a bulk order of red jasper and a prehnite specimen; the stone for healers - I take that as a huge sign of affirmation from Spirit. I am so excited to start my healing practice and possibly even in person! I would love to rent a space somewhere, but that may be a while. I completely believe in the power of crystal healing. I am truly honored to be a stone healer. Also, something big happened with my hair this week: I went ombre! I haven't had blonde in my hair since I was 15-16! This past year I have been dying and experimenting with reds, but the upkeep was 1) expensive and 2) I am super lazy and anti-maintenance when it comes to hair. So it was overgrown for a while and looking kind of ombre so I just went for it. It's summer and fun, and I will be going to Vegas soon with some girlfriends so, why not? I love the sassiness of it! My boy digs it too. Even Indy noticed something was up with me! Speaking of Indy, my boys both got flea baths today in the shower. I sat in the shower with them in my bikini (we don't have a tub) while Jimmy adjusted the shower head, it was quite a spectacle. But now both are fuzzy and soft and completely exhausted. It's precious. Now I am catching up on some work and trying to stay cool in this crazy heat. I hope you have had a great Sunday!